These fishing holes are found in the Alberta Rocky Mountain National Parks (Such as Banff and Jasper) and in some cases British Columbia (Such as Kootenay National Park). Generally these reviews cover places that require some hiking and/or biking but there will be some exceptions. 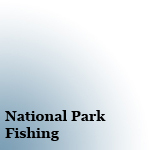 Fishing ratings are based out of five and are based on my experience fishing that lake. Things I consider are the size of fish, water clarity and how active the fish are. The ratings can be updated if I return to that lake and my experience change. I do not consider things like the view or how hard it was hike too. Your experiences at these lakes will most likely vary. Fish stocking may also change your experience.